2016 was one of my favorite years so far. I got to meet some of the most amazing people and spend the most important day of their lives with them. Carrie and Kyle had one of the most amazing weddings I’ve attended to date. I met the two of them just before they moved to Colorado from Chicago. They were planning a Spruce Mountain Ranch wedding, in Larkspur from halfway across the country at the time. We met at a coffee shop in Denver, and I knew from the moment I first talked with Carrie and Kyle that they were amazing people. To say that Kyle lights up when Carrie enters a room is an understatement – the two of them are just smitten for each other. Once September rolled around, I attended their rehearsal dinner at Wynkoop Brewery and was able to meet their closest friends and family the night before the wedding. I love when couples opt for rehearsal coverage – I get to spend some more candid time with the most important people in their lives. Just after dinner, a few people stood up for some speeches. One line that was spoken that really stuck with me was a family member said “to be with Carrie and Kyle is to be in the presence of love. To really know what love is.” Following the speeches, Kyle’s uncle gave a beautiful guitar and song set. Come to find out, Kyle sung at his uncle’s wedding – it was an emotional and lovely performance to be invited to witness. On the next morning, September 24, 2016, Carrie and Kyle had their Spruce Mountain Ranch wedding at Trey’s Vista. I’ve attended quite a few Spruce Mountain Ranch weddings, but this was my first time photographing at Trey’s Vista. The views are stunning and the weather was a gorgeous mix of sun and clouds. Carrie and Kyle decided to do a first look at the doors to Trey’s Vista just before the ceremony. One of the things that I love about first looks is the privacy they offer, and allow for you and your fiancé to have a moment just between the two of you. The moment Kyle turned around to see his bride, his smile widened and his eyes swelled up with tears. This feeling was what his family was talking about – we could feel the presence of love in this exact moment. After a lovely ceremony, that included Kyle serenading Carrie, we headed over to the Ponderosa Lodge for a night full of fun and celebration. It wasn’t until just before it happened that I knew about it, but Kyle’s family had a “surprise” for the couple during their reception. All the men on that side of the family had coordinated a dance – complete with posters, break dancing, and lots of hilarious shenanigans. The entire night was a blast to be a part of – everyone was having the time of their lives. To end the night, we headed back out to Trey’s Vista for a few “Star Shots”. It’s pretty rare that we have a dark enough location with clear skies to get the Milky Way in the image. This was one of those rare, perfect nights. 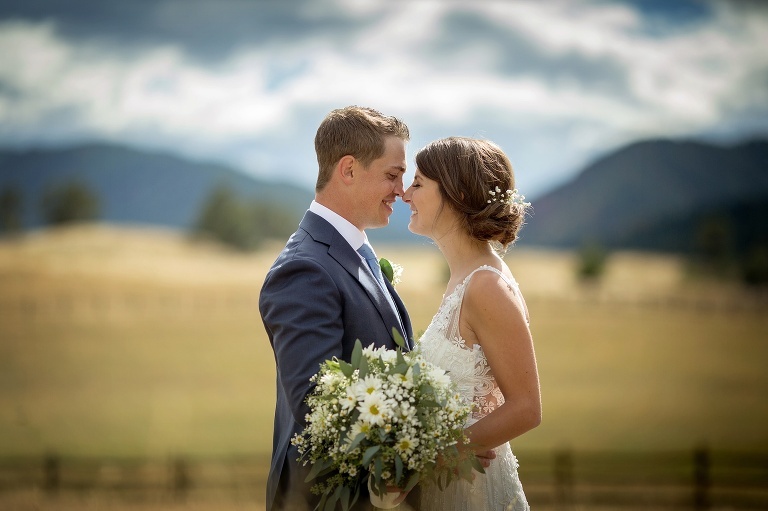 Thank you again, Carrie and Kyle, for inviting us to photograph your Spruce Mountain Ranch wedding – it was an honor to be a part of your incredible wedding day. I wish nothing but the very best for the two of you. They look totally smitten for each other! What a beautiful wedding! Wow! These are fabulous! So many amazing shots! What an absolutely stunning wedding. I love all the bride + groom shots and the detail shots are AMAZING! This is such a beautiful wedding! The reception/dancing shots are so sweet. Gorgeous images! What a beautiful love story! What a beautiful wedding! I love the way you captured the first look in that huge doorway. Gorgeous.